This year it took little longer to burn the earth, oh I'm talking about summer. In whole India, almost in every state, Thunder storm is striking and summer is not able to smash the storm. So till we didn't have to turn on AC. But there is not guaranty that the storm will be able to protect us from the scorching Sun. so we have to be prepared for the burning sensation and be ready with your summer cooler. 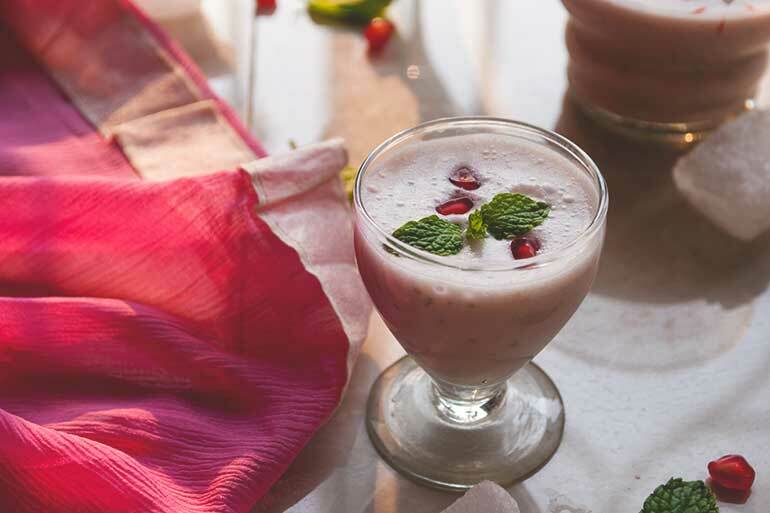 That's why I've bring something new for you, the 'Pomegranate & Mint' lassi. Take the pomegranate kernels in a juicer and extract the juice. If you don't have juicer, just blend in a regular blender, strain the juice through a large strainer. Now take a blender, add curd, mint leaves, black salt, sugar and blend till the mixture becomes smooth & fluffy. It'll take 1 to 2 minutes. Add the pomegranate juice in the same blender and again blend to mix everything nicely. That's it. Pour the lassi in glasses, serve with ice cubes & mint leaves. I like lassi a bit thicker, so didn't added any extra water in it. But if you want the lassi little thinner, add 1/2 cup water to it while you have added the pomegranate juice into the blender, and blend.